Just Shearing have available a full colour, 2010 shearing cartoon calendar, illustrated by Jed Dunstan, and entitled 'Bale Number 2010'. 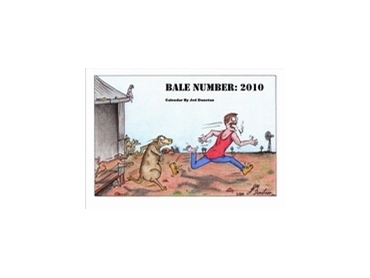 The 'Bale Number 2010' shearing cartoon calendar is a unique calendar depicting the humorous experiences of a young shearer from Ngapala in South Australia, with each month featuring a different comical cartoon. Illustrator Jed Dunstan's heritage lies in the Australian bush country and as a result he loves sheep and shearing & just happens to be a great cartoonist as well. This is his 3rd calendar of his inspired thoughts and cartoons from working in the wool shed. The shearing cartoon calendar features the dry humour of the Australian country, bush and the back bone of the Australian country; the sheep and the shearer. Even the wool classer, the presser & the roustabout make an appearance in this comical look into the lives of shearers in Australia. When folded the calendar is A4 and opens to A3 size, and is also hole punched for hanging. The calendar is printed in full colour on sturdy paper and protected with a coated thin cardboard cover.